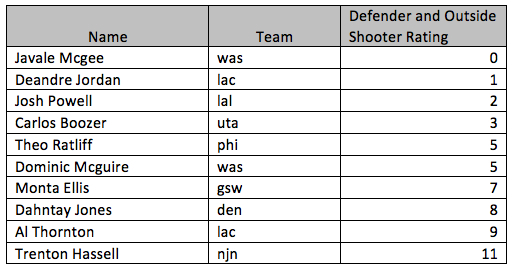 In my last look at this subject, I calculated each player’s impact on his teammates’ three-point shooting tendencies (for a description of my methodology, check the article). We often believe certain players create open outside looks for others, and the numbers seem to confirm that. There was one minor flaw in my calculations, though. Today I’m releasing an updated version of my numbers with some minor improvements. First, only players with 50 three-point attempts or more can have an impact on a teammate’s percentages. Secondly, to account for potentially large discrepancies between on-court and off-court attempts, the new weighting system takes into account the standard deviation of the difference between a player’s on-court and off-court numbers. With the update, among players not named Aaron Gray (I really don’t know what his deal is), Dwyane Wade is the new leader in impact on teammates’ three-point attempt percentage. Jason Terry is now second, followed by LeBron James in third and Chris Paul in fourth. There are a few more things I want to do with this data, because stats such as this one may be useful in telling us how players interact with each other. If we can accurately measure and predict player interactions statistically, we’ll know much more about the game of basketball. Dwight Howard is a defensive presence in the middle, that’s for sure. His size and athleticism make him quite the deterrent for offensive players trying to take it to the rim. But how big of an impact is he actually having? Does he make opponents less efficient around the rim, or does he simply scare them from attempting close shots in the first place? Here we see two negatives and one positive. When Howard is in the game, opponents get to the free throw line more often and surprisingly convert more of their close attempts. On the other hand, they tend to attempt less layups and dunks. This is a good thing for the Magic because of how effective those shots are. Both players have results opposite of Howard’s. 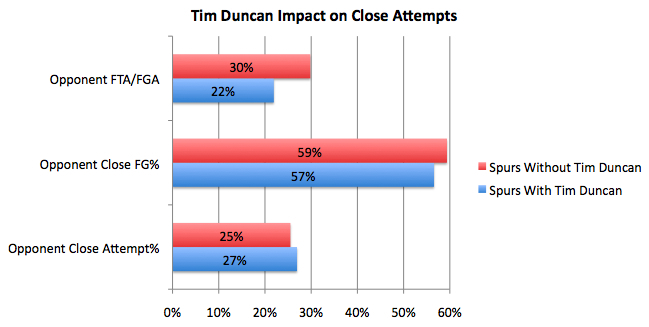 Duncan and Garnett limit their opponents’ ability to get to the line and also make them less effective around the basket, but are challenged more often than Howard. To be honest, I’m surprised that Howard looks as ordinary as he does according to the numbers. I expected him to have a dramatic impact on all categories, but that doesn’t appear to be the case. One thing to keep in mind is that these statistics don’t take into account the level of teammates, so if Howard is often paired with a weaker interior defender such as Rashard Lewis he may be underrated. We can do much more with these numbers, though, and next time I’ll do that. 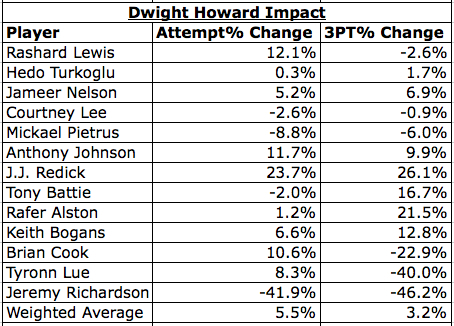 Specifically, I’ll take a look at which players are affected the most by Howard’s presence. One thing I should have done in my study was take teammates more into account. I took a look at the top subs of some of the players, which was hinting at the issue, but I didn’t delve into it further. A player’s impact on his teammates’ three-pointers could be deceiving if he tends to be on the floor with certain teammates frequently. For example, I pointed out that one of Dwyane Wade’s top subs was Daequan Cook, a long-range bomber. This makes Wade’s impact on team three-point shooting look smaller than it actually is. What about the players who often play next to long-range shooters? Dwight Howard plays a lot of minutes with Rashard Lewis, so it makes sense that the Magic shoot a lot of threes when Howard is on the court (but not necessarily because of Howard). To get around this, you have to look at it on a player-by-player basis. Below I have tables for four of the players in the original study. Each table includes the superstar’s impact on the three-point attempt frequency and efficiency for every player on his team. At the bottom, I calculate a weighted average. When we use this approach, the results tell us something different. Dwight Howard still has a large impact, but it’s no longer the biggest of the bunch. 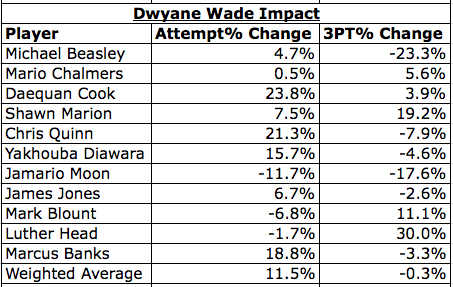 On average, Dwyane Wade increased each Heat player’s three-point attempt percentage by 11 percent. 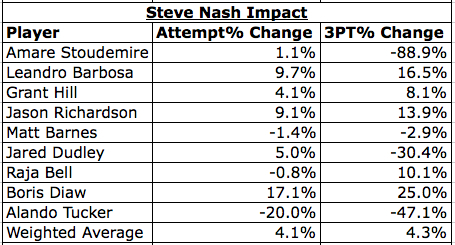 Even Steve Nash, who I originally said had no effect, creates an average increase of 4.1% for his teammates. Additionally, Nash makes his teammates shoot three-pointers more efficiently, raising their 3PT% by 4.3%. This new data may change the specifics, but it further confirms the original idea: superstars create good three-point looks for their teammates. 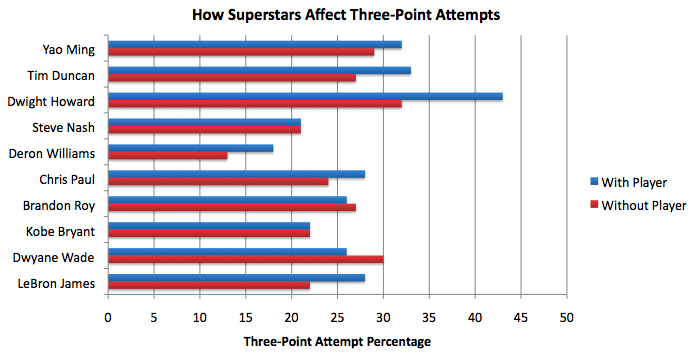 Do Superstars Increase Their Teammates’ Three-Point Attempts? A common approach for NBA teams is to surround their superstars and offensive playmakers with efficient shooters who are more than willing to hit the open three-pointer when given a chance. The playmakers draw much of the defense’s attention and command double and triple teams. Therefore, it is prudent to collect efficient shooters around them. Do the numbers support this way of thinking? Do teammates of superstars take more threes when the superstar is on the floor? 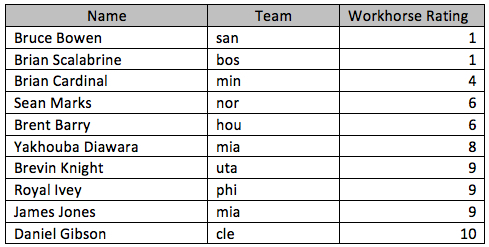 To answer these questions, I turned to the play-by-play data available at Basketball Geek. 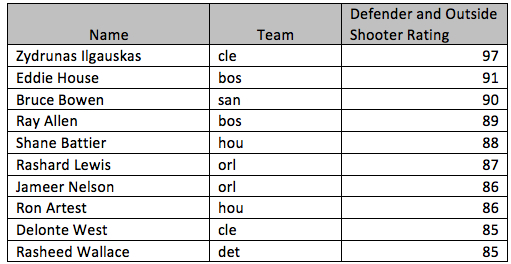 I picked 10 superstars and broke down their team’s three-point shooting data to see how often the team shoots three-pointers when the player is on the court versus how many it shoots when the player is off the court. The superstar’s own three-point shooting was not counted. To measure three-point frequency, I calculated the total number of three-point attempts divided by the total number of field goal attempts. As you can see, most of the players increase the three-point frequency of their teammates while they are on the court. The most extreme case is Dwight Howard, who increases the Magic’s three-point attempt percentage from 32% when he’s off the court to a staggering 43% when he’s on the court. In other words, if you’re playing with Dwight Howard, there’s a 43% chance your next shot will be a three-pointer. Big men in general tended to have the largest effects on three-point frequency, supporting the common strategy of having a dominant post player who demands double teams and can kick out the ball for open threes. The Magic, in particular, killed teams with this strategy. Two of the three point guards I looked at had similar effects as the big men, while swingmen were a mixed bag. Why do some superstars not increase the three-point frequency of their teammates? I had a hypothesis about this: when those particular players subbed out of the game, three-point shooters were replacing them. This, of course, would make the three-point frequency when those superstars were off the court deceptively high. Except for Steve Nash, it appears as though my hypothesis was correct. Dwyane Wade and Kobe Bryant, in particular, had subs that can be considered three-point specialists. 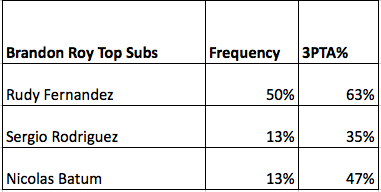 If these superstars had subs that were equally as fond of two-pointers, I imagine their impact on team three-point frequency would be similar to the other superstars I looked at. So what’s the deal with Nash? His subs weren’t particularly in love with three-pointers, yet Nash did not increase team three-pointers. I think there could be two things behind this. For one, Nash is not a typical superstar that overwhelms his opponents with his physical abilities. He may draw the attention of defenders, but he’s certainly not demanding many double teams. Second, Nash may just be really good at setting up open looks by the basket, as I imagine Amare Stoudemire and Shawn Marion can attest. In the end, if one player doesn’t fit in with the rest of the superstars, I’m not very surprised if it’s Steve Nash. 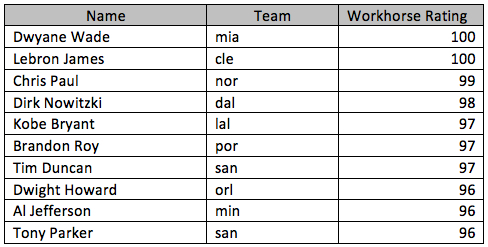 It’s nice when the statistics confirm the common dogma among NBA teams. Teams collect three-point shooters to surround their superstars, and these strategies appear to be valid. These same shooters, when the superstar is off the court, don’t shoot nearly as many threes. I believe the results of this study should serve as further encouragement to NBA front offices that they should continue to acquire efficient, three-point shooting role players if they have a superstar on the roster. Last time I introduced my TPS (Talent Plus Style) system and a basic statistic using that system called Playmaker Score. Today I’ll show a couple more statistics I’ve developed using TPS. The first rating is something I called Paint Presence Rating. Before I go any further, remember that all ratings are adjusted for position, so some point guards rate higher than centers, even though they are obviously not greater “paint presences.” Paint Presence Rating is determined by a player’s Composite Score, Close Attempt Percentage, Close True Shot Percentage, free throws/field goal attempts, and Rebound Rating. Composite Score reflects a player’s all-around ability while the other four are all affected by a player’s skills/tendencies around the basket. The second rating is Perimeter Threat Rating. This rating reflects a player’s tendency to shoot three-pointers and his ability to make them. It consists of three components: Composite Score, Three-Point Attempt Percentage, and Three-Point True Shot Percentage. The third and final rating I will release today is called Super-Efficient Rating (it sounds silly, I know). It incorporates three elements: Offensive Rating, True Shot Percentage, and Turnover Rate. Offensive Rating is a good catch-all for every efficient thing a player can do offensively, while the latter two measure a player’s ability to hit shots when he needs to and not turn the ball over. Things such as assists and offensive rebounds are also part of offensive efficiency, but they are only partly incorporated, through the use of Offensive Rating. To see all the numbers, go to: Link.